PhotoAcute Studio improves the quality of photos taken with digital cameras and camera phones. 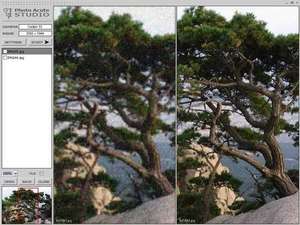 It increases resolution, reduces noise, removes chromatic aberrations and vignetting, and corrects brightness of overexposed and underexposed parts of the picture. PhotoAcute Studio processes sets of photographs taken in "continuous mode". RAW and 16-bit color support. PhotoAcute Studio 3.016 is a shareware program and can be used as a demo to try the software until the free trial period has ended. A full version of the program is available after the trial period ends. For security reasons, you should also check out the PhotoAcute Studio download at LO4D.com which includes virus and malware tests. Additional screenshots of this application download may be available, too. PhotoAcute Studio has a presence on social networks.